In the Beginning | Beginning each day in the Word and prayer. The Easter narrative makes us fully aware of what happened on the first day of the week. 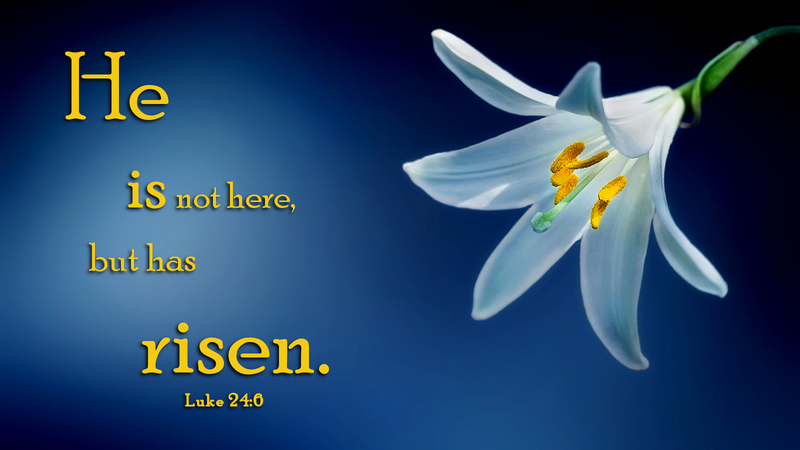 Women went to Jesus’ tomb and found he was not dead; he was raised. The news spread throughout that first day of the week with Jesus appearing to his disciples and two people on the road to Emmaus. Easter changes lives, but for our world today, what are we to make of Easter on the second day of the week? On Easter Sunday, churches were filled with worshipers. On the second day of the week, with the chorus of Jesus Christ is risen today!” fresh in its ears, the world returned to work. How long will it be before doubt once again creeps back to the forefront? By the second day of the week, the daily struggle of earthly life returns in force. For many, grief remains, worry returns, relationships are still broken, and death looms on the horizon. Living in the midst of our brokenness, some forget that because of Easter, these things no longer have power over God’s people. In the face of sin and death, we have the promise of life in God’s kingdom. Jesus’s resurrection on the first day of the week sets the tone for life in the face of death. It brings forgiveness in the face of sin. Through his death and resurrection, Jesus conquered the powers that defy God. On the first day of the week, every week, God’s people are witnesses to these things. Prayer: Holy God, as we worship you on the first day pf the week, fill our hearts with Easter joy all the days of our lives. Amen. It’s a long walk down the road to uncertainty, a long dark walk. Turning points are few, and often misunderstood. That’s the road Cleopas and his companion were navigating. That might be wishful thinking. When you’re lost, you’re not really navigating. You’re just walking. We have all found ourselves walking that road at one time or another. Whether it is grief, depression, loneliness or addiction, the road to uncertainty is one which is well traveled. Sometimes there are sign posts that will redirect us in the way we should go. But even these are often unrecognizable. Remember, it’s the road to uncertainty. It’s hard to travel this road alone. We need someone to point the way. 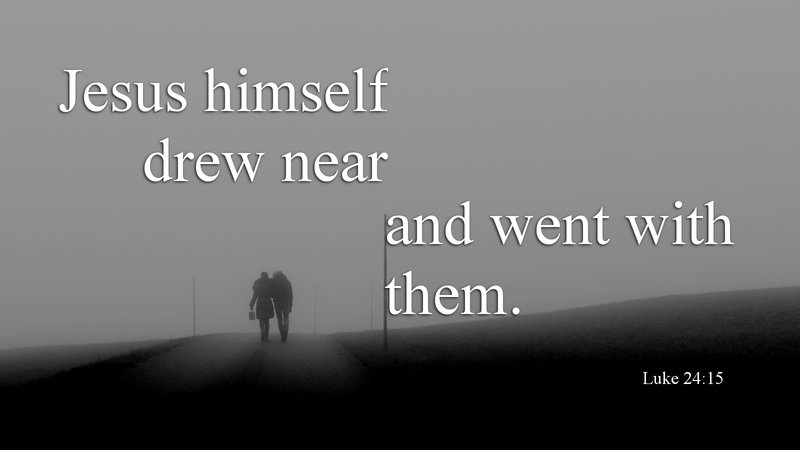 The stranger that joined Cleopas and his companion seemed to know something the others didn’t. As they walked together, the risen Christ joined them and taught them that God’s intent went far beyond the pain of the cross. Jesus helped them recognize that out of darkness, God brings light. Out of despair, God gives hope. Finally, in the breaking of the bread, theirs eyes were opened. Through Christ, the road to uncertainty finally has a destination, a relationship with the one who restores hope as we walk with him in faith. 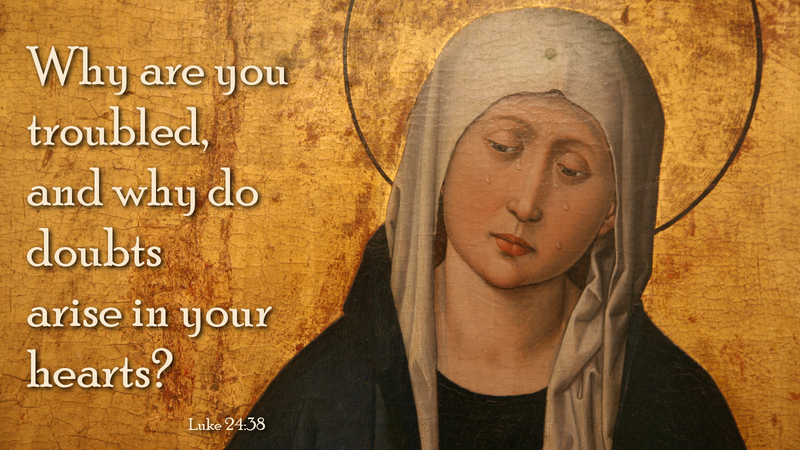 Prayer: Teach me your ways, O Christ, that I might walk with you today and always. Amen. Were you there? No doubt many sang this beloved hymn on Good Friday. Were you there when they crucified my Lord? Of course, you were. Though not physically, your sin, my sin, our sin was there. It is what nailed him to the tree. It is the reason Jesus had to die. Or what about when they laid him in the tomb? Were you there? Surely you were. The wages of sin is death, and we are all sinners who have fallen short of God’s glory. We have not kept God’s commandments, and we have not even come close to loving one another. Jesus paid the price for our disobedience. He died. We buried him. Yet, today is the day of resurrection. 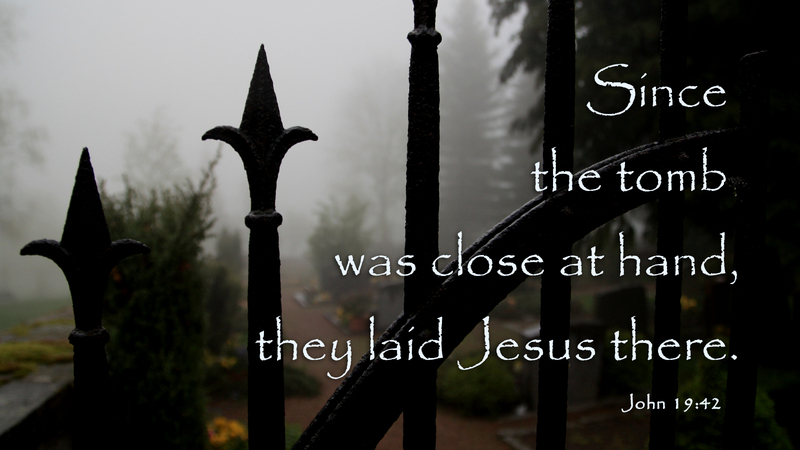 Were you there when God raised him from the tomb? Were you there to meet the risen Lord Jesus as the great stone was rolled away? Though not physically, you were. God had you in mind when Jesus died, and he had you in mind when he raised him up on the third day. You were there, and so was I. In fact, all who call upon Christ as Lord were present in the eyes of God the day Jesus was raised. Because you are precious in God’s sight…you were there. Prayer: O Lord God, in my heart, I give you thanks and praise. For you have saved me from my sin. Amen. What do you do when you feel all hope is lost? When dreams are crushed we are devastated. When we lose someone who is dear, we grieve. When all of this comes at once, there is no direction in which to turn. Such was life for the disciples who followed Jesus and the women who traveled with them. Their Lord, their hope was dead. Crucified and buried, Jesus was no more. At least that’s what the world would have them, and us, believe. When the reality of sin shatters our hopes and dreams our lives are often sent into a tailspin. Especially when it comes to matters of faith, hope and love, we need assurance. We long to hear from God that all is well. But fear and doubt all too often rise to the surface and cast a long shadow. It’s in these times we forget the words of Christ, that he would be raised on the third day. Peter, James and John, along with the other remaining disciples hid in fear. Joseph of Arimathea obtained permission to bury Jesus’s lifeless body. The women who followed along saw where his body was laid. They thought it was over. Jesus’s words had fallen silent. But in the still of our hearts, Christians today know our Redeemer lives. With the assurance of the gospel, may God’s people keep vigil today. Pray and prepare for the feast to come. Prayer: In the quiet of our hearts, O Lord, hear the prayers of thanksgiving for your mercy, grace and love. Amen. I am looking at you Jesus, staring actually, and I have to get something off my chest. I know why you are hanging there on that cross. It’s because of me. You taught me the way of God’s love, but I failed to listen. You showed me how to walk by faith, but I wandered off in my own direction. I didn’t always love you with my whole heart, and I seldom love my neighbor with the love you have for me. It’s my fault. I’m the guilty one. Jesus, I can’t put into words how I feel at the moment. I should be there, not you. I should be the one sentenced to die, but you stepped in. On Sunday, I shouted “Hosanna!” But today my voice was one of those calling for your crucifixion. Oh, why did I do that? What was I thinking? Yes, I know, I was thinking of myself. Prayer: Thank you Jesus. It’s all I can say. Thank you for your grace. Amen. 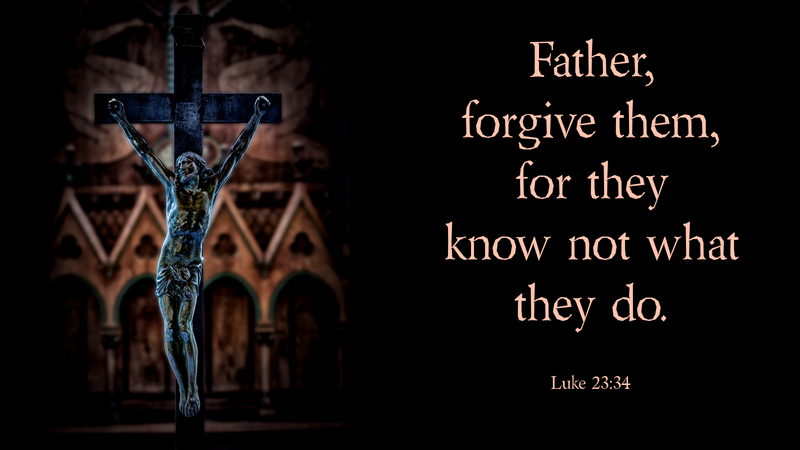 Beginning the Paschal Triduum (Three Days), Jesus provides the answer to a much deeper question; “For whom did Jesus do all of these?” For whose sake did he stop along the way and have compassion? For whose benefit was it that Jesus taught in parables and performed signs and wonders? Who profited from his suffering and death? Who did Jesus come to deliver from the powers of sin? You. He did it for you. On the night he was betrayed, Jesus gathered his disciples and told them about the things that would soon happen. Jesus didn’t explain the full meaning of his death, but he left no doubt as to its significance. Jesus met the twelve in a most intimate time and place, during the Passover meal. On that night, in the bread and the wine, he offered them (and you) his body and blood for the forgiveness of sin. In the same way, even now our Lord Jesus meets us at the table. He provides more than just bread and wine. He gives us more than a means to remember his sacrifice. 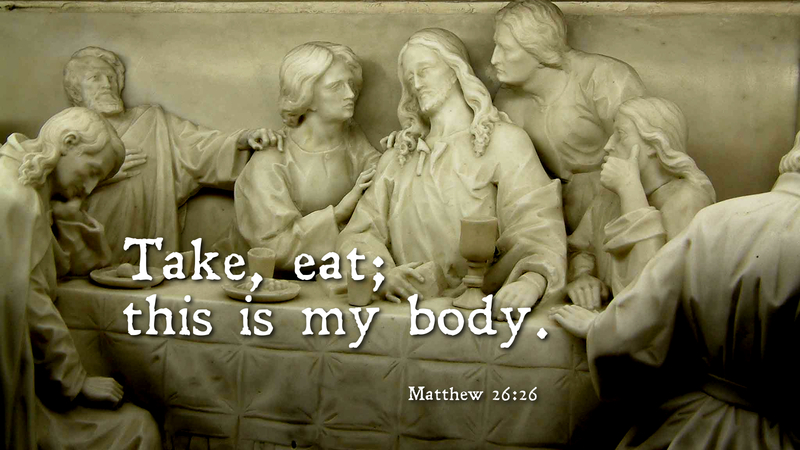 Jesus provides us with heavenly food, his very own body and blood. Never was there a gift so precious, never was there food so satisfying. He gives it to you and to me so that we would live with him forever. Prayer: Thank you Lord Jesus, for saving your people from their sin. Amen. What do you want to be when you grow up? That’s a question that we all faced at one time or another. Some probably wanted to be doctors or nurses. Some perhaps wanted to be a professional athlete. Still someone might have wanted to be an actor or singer. Have you ever noticed few children, if any, say they want to be a garbage collector? Fewer still might say they want to be the school custodian, or the person who makes up the beds in a hotel. When we are young, we want to stand out; we often dream of making it big. We have dreams for our future. Jesus never asks his disciples about their vision of what their lives might be like once he is departed. Instead, he leads the twelve on a journey of humility and service. Jesus leads and they follow. Our Lord teaches the twelve and us that in order to be counted first in God’s kingdom; we must become last of all and servant of all. Certainly we dream about the future. 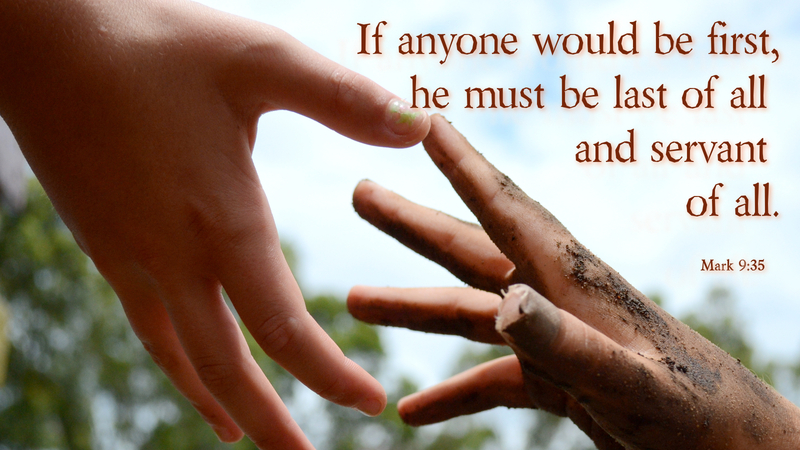 Yet, no matter your vocation or station in life, blessed is the one who puts the needs of others above their own. Truly this one is counted first in heaven. Prayer: Holy God, give us the will to follow Christ, becoming as servants of others and inheritors of your kingdom. Amen.